They seemed to have morphed into the Hartley Players in 1926, who are still going strong. Productions included "Out of Frying Pan" (1925), "The Young Person in Pink" (1926). 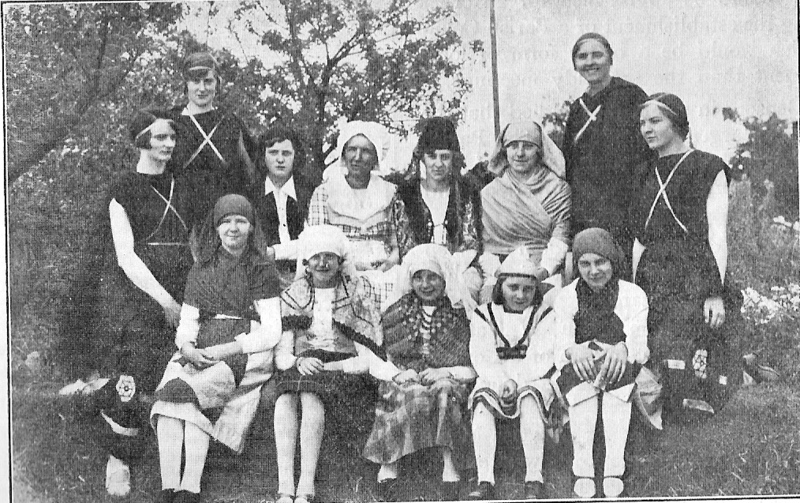 The last production before they became the Hartley Players, was "Playgoers" in 1926. The brass band was founded by Tom F Tate in November 1923. From the beginning the band included a nucleus of experienced players, together with enthusiastic amateurs. A public meeting at the old schoolroom launched it on November 13th 1923, and 25 immediately joined from Hartley and the surrounding villages; uniforms were donated by Mr Cuff. Its first concert was a section of hymns in Hartley in March 1924. On July 27th of that year the band was present at the unveiling of the Longfield war memorial. By 1929, membership was 19 and they had raised the £320 to pay off the loan on their instruments. The band had many ups and downs, but played an important part in the social life of the district until its dissolution on 31 January 1935. Frank Tate, the last Secretary said the last AGM of 20 November 1934 made that decision because of a lack of interest by members and a falling off of demand for its services. (Hartley Parish Magazine Dec 1924, Jun 1929, Mar 1935). Refounded in January 1970 with Mrs Goodwin of Ash as its secretary. Its films of Hartley in the 1960s are a precious, if fragile, historical resource. Founded in 1931, it rapidly expanded to boast 64 members. The Parish Magazine has many entertaining reports by the club's secretary Gomer Davies. In March 1933 he wrote "anyone who is dissatisfied can have their money returned in full..... All meetings are free"! Nationally the League of Nations Union began in 1918, and it became one of the biggest peace organisations the country has ever known. Hartley had an active branch which was founded in 1929, numbering 70 in 1931 and 75 in 1936. In November 1934 they organised an all parish poll on the aims of the Union which was answered by around a third of the adult population. It shows the vast majority did not want a repeat of the first world war, however the Debating Society vote was much closer. (Parish Magazine Mar 1935). The Left Book Club was founded nationally by publisher Victor Gollancz in 1936. It supplied a book of the month for 2s 6d, as its title suggests the books were socialist orientated. Hartley had one of the 1,500 Left Discussion Groups by 1939, which continued into the war. For example in February 1940 they held a discussion on "Federal Union" - a subject of interest to all parties, Winston Churchill was to offer such a scheme for France and the UK only a few months later. (Dartford Chronicle 5.5.1939, 1.3.1940). In existence by 1924 and probably before (Parish Magazine March 1924). It was led by its conductors, first T F Tate (to 1925) and then W H Chisholm. Founded by Rev Henderson in 1944, he wrote in the September 1957 parish magazine it was threatened with closure if help couldn't found. Although shortlived, this association played a vital role in saving two children from tyranny. They helped a mother and two sons who had been forced to flee from Austria. She had a Jewish grandmother and for that reason her husband disowned her and their children, and for her to flee. The association began when Leslie Gates and his wife, who owned a smallholding in Fairby Lane, offered a home for the elder son. With the help of their friends they organised a meeting on 27 February 1939 to set up the association and get pledges of money. The arguments of the opponents would be familiar today, but there were sufficient people of goodwill to raise the large sum of £80. Shortly after his 13 year old younger brother arrived to stay in Hartley. He stayed in Hartley until he completed his education at Dartford Grammar School in 1941. He then got a job at Mr Gates's insurance company, but in 1945 became an interpreter at the Neuremburg trials. He later emigrated to Canada where he became a university professor. This organisation campaigned against the decision to grant planning permission for New Ash Green in 1963. They put up a valiant effort, and their correspondence fills more than one suitcase. The association was wound up in 1967 on the day the first people moved into New Ash Green. Reverend Henderson in the Parish Magazine of May 1955 recorded the end of this club: "After 9 years of very happy associations the Social Centre has clolsed down. When we founded the Centre after the war in 1946 there seemed a real need for it in the village, and its programmes of music, films, travel and career talks, debates and quizzes received enthusiastic support. More recently with increased facilities, television and other interests numbers dropped, and it became obvious to the officers and committee that the centre could not continue. The balance in hand of £35 has been divided between other organisations in the village. As President, may I take the opportunity of recording my thanks to to officers, committee members and supporters for all the help they gave us on those Tuesday evenings at 8." I remember this club a bit, and the old kerb drill ("look right, look left, look right again, if all clear, quick march!!"). As I recall you got a stamp each week on a card which when full could be exchanged for a "Bar Six" chocolate bar. Tufty was the red squirrel that led the animated public safety films from the 1950s. Tufty Clubs were started in 1961, but it was not until 1966 that Hartley got one of their own. It was a great success, by 1968 as many as 120 children were attending each meeting (Gravesend Reporter 27.9.68). It switched from the Kerb Drill to the Green Cross Code in 1971. Once numbering 25,000 Tufty clubs faded out nationally in the 1980s (Hart Mar 1970, Jul 1971, Feb 1972). The village fete began as the All Saints' Fete, but the church gave the event to the village in 1963. Its format was that a public meeting each year would decide where the money was to go. Those proposing the fete would be expected to form the bulk of the committee, although some stalwarts were prepared to serve year after year whichever charity was chosen. The venue has been variously Hartley Primary School, the Country Club and Manor Field. It was more than just a fete, as there were many other events associated with it. For example in 1984 there was a Flower Show, Talk, Concerts, Dancing Displays, a Fashion Show and a Sponsored Walk. Sadly the 2002 fete was the last one. Since 2001 the Arthritis Research Council have run an annual "Jazz Picnic" fete. In 1968 the Mote House Cup was inaugurated for the best dressed stall, the current holders are the Round Ash Pre-School. A Youth Club existed as early as 1935 (Dartford Chronicle 8.3.1935). The Youth Club started an annual lunch for the elderly in 1961. When the Club was disbanded the village fete took over financing the lunch (Hart March 1976). The Hartley Churches Association reformed the club in 1976 which met on Fridays, but poor support led to its closure in 1980.